10/2/2013Share this story on Facebook! Some people go to school so that they can make a difference in the world when they graduate, but Maritsa Sherenian ’11, M.S. ’13, was not interested in waiting that long. First as an undergraduate in IC’s speech-language pathology and audiology program and then as a graduate student, she has dedicated her time inside and outside the classroom to helping people with speech disorders overcome the obstacles they face every day. IC’s speech-language pathology program is designed to give students the tools they need to help others overcome those problems, but it’s the experience Sherenian has gained in the field that has truly prepared her to make a difference. As an undergraduate, she spent her first clinical placement helping a young boy with accent modification. And during her first year of graduate school, she worked with preschoolers through a program called Head Start, which helps families that have lower socioeconomic status and greater risk of health problems. Sherenian followed up her experience with Head Start by working with a young client who suffered from Rett syndrome, a disorder of the nervous system that can inhibit verbal expression. Using pictures and pre-made pages, Sherenian helped her client develop her ability to communicate. Sherenian believes this sort of firsthand experience is part of what makes studying speech-language pathology at IC exceptional. “I have friends who went to undergrad here with me who went to other graduate schools for speech language pathology, and what I’ve found is that they’re not getting as much of the clinical aspect as we are getting at IC,” she says. Through IC’s graduate program, Sherenian has had opportunities to see how speech-language pathology is being practiced in new and creative ways. 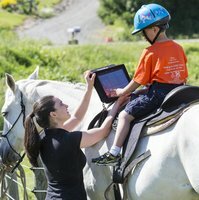 One such opportunity is Strides©, an equine therapy program for autistic children that blends horseback riding and modern technology. The program is put on by Southern Tier Alternative Therapies. 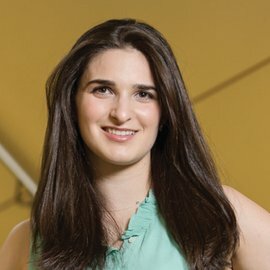 The unique angle on speech therapy offered by Strides© has inspired Sherenian to explore new possibilities in her own career after graduation.